Un synthétiseur tout en couleur! Disposez vos timbres sur vos patchs comme un peintre pose ses couleurs sur la toile! Dazibao permet ainsi de créer à la vitesse de l’éclair les timbres les plus riches et les plus complexes. A music synthesiser programmed with colours! Dispose your tones on the patches as an artist disposes his colours on the the canvas. 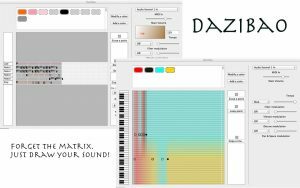 Dazibao helps the musicians to create easily and quickly as never before the most complex musical tones. Forget the matrix, just draw your sound! Dazibao exists for iOS and MacOS. Dazibao MacOS includes a keyboard tuner : you can tune freely your MIDI keyboard with. It includes also an internal recorder (there is not any AU plug-in anymore). Record your playing (while your host sequencer is running if needed) and drag and drop your audio file to the host. Use IAC if needed. Dazibao iOS includes a drums and bass line (analog style). 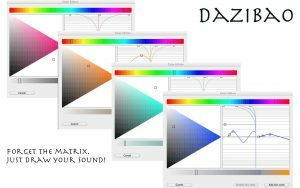 This version allows to create sessions (several patches for Dazibao + several rhythms with the drums and bass line) for concerts : play Dazibao live! Patches can be shared between the two versions via iTunes (patches only, files « .dazbao »).